This program is offered freely to help you with your issues. We have been there too! We did a lot of work over the last 3 years to help people infested with lice. costs in keeping this resource available. A new strain of hair or head lice has been around infesting people all over the world for a number of years now. The lice are not killed by modern shampoos and chemical treatments currently available in the drugstore or chemist. The companies producing these products have in fact developed new treatments but it will be several more years before the new generation of anti-lice products become available. It takes several years for such products to pass through strict tests and safety precautions before they can be legally sold to the public. Unfortunately, most members of the public are still unaware that a 'resistant strain of head lice exists. They purchase lice shampoos only to discover later, after their money is spent, that the lice have not been killed by the treatment. They may then try other methods, like the traditional combing through with a lice comb, or by applying 'alternate' lotions and potions, but find they are still unable to eradicate the lice infestation. Children are infested more than adults because they are more likely to pass them from one person to another at school through head to head contact. Entire schools both in the USA and the UK (and probably throughout Western Europe) have large numbers of infested pupils and the problem is still growing. Our program was designed to beat the lice without using any poison, shampoos, or chemicals. It is the result of studying and understanding the reproductive cycle of the lice and acknowledging the way this cycle works. Our program uses the 'combing' technique in such a way as to remove the lice in stages which precisely interrupt and disable their reproduction. What you are going to do on this program is to understand for each day of 21 days what your enemy - the lice - are doing and then you are going to take actions to counter-act their activity so that by the end of 21 days there are no more lice or eggs in your hair or in the hair of members of your family. You are also going to take action to ensure you and your children are not re-infested by other people or children again. Beating any issue is about understanding it first. To get rid of lice, you need to understand something about them. They are not nice things to think about, we know, but in the main they are not actually harming you - that is, it is very unlikely they are transmitting any infections to you. You may not like them but if you learn to respect the way nature has designed them, then you won't underestimate them and you will be more motivated to stick to the program. Head Lice lay eggs. Once the eggs are laid in your hair, they are not removable! You can remove every living louse from your head but within weeks, you will be crawling with lice again because the eggs will hatch and re-infest you. Your enemy's strength and advantage is the process of their egg-laying cycle, and the time it takes for new-born lice to lay new eggs. Let's consider the way a single louse is born, grows up, mates, and the time it spends as an egg-laying adult. In this example, the louse is a female. The eggs are super-glued to your hair shafts. Combing your hair will not remove them! Many people infested with lice comb their hair and remove what they believe to be lice eggs, when in fact, what they are removing are discarded skins of moulted lice and lice excreta. The young louse develops inside the egg and is ready to be born between 5 to 10 days of the egg being laid. It normally hatches around day 7 but the exact day of hatching can vary from egg to egg, and can take longer or shorter time to hatch depending on how warm or cold it is during its development period. The way the egg hatches is interesting. The young louse inside the egg breathes in air through the egg membrane. The air passes through its body and is ejected at the rear end. After a while, the air inside the egg builds up pressure behind the young louse (the larva), pushing it forwards so that its front end finally makes contact with, and breaks through, the egg wall. Some treatments, for example - applying various oils to the hair - prevent air from passing through the egg wall and thus interfere with, and prevent the egg, from hatching. Various rates of success have been reported using oils on the hair in this way. However, we will not be using this method in our program. The louse is born as a larva. A larva is a tiny maggot. Its skin, called chitin, is already hardened before leaving the egg and it is therefore able to feed (by taking blood from your scalp) immediately. After 4 days, it sheds its skin - moulting to emerge as a nymph. After another 3 days, it moults again to become a 2nd nymph. After another 2 days, it moults again for the last time and emerges as an adult, although it will be another full day before it can mate and lay eggs. The adult will live for about 30 days and will lay between 3 to 9 eggs each day, that's 275 - 300 eggs normally during her life-time of 30 days as an adult. The female will live and move around most of the time on your hair shafts. Her claws are designed to grip your hair precisely. She can run through your hair at unbelievable speeds, switching from one hair to another like lightening. She only goes down to the root of the hair when she needs to feed. Once she has filled herself with blood, which normally takes 5 to 10 minutes, she will climb back up into the safety of your hair. She likes to roam. It is because she doesn't stay in position feeding that she is likely to crawl onto someone's else hair if the host person's head (your child) is in contact with someone else head. Children like to hug each other and their heads come into contact quite often. Children are therefore the inadvertent friend of the female louse! If a female louse accidentally falls off your head, or more likely, crawls off onto a pillow, hat, or some other fabric, she will have made a fatal error. Away from the hair and your head, it is unlikely she will survive longer than a day or so. She needs your warmth, the oils in your hair to stop her drying out, and the blood of humans for food. There is little point in going mad cleaning your house, children's clothes, carpets, or bed-linen thinking they are infested or full of lice eggs. They will not be infested! Possibly, if children swap or wear the same hats, a few lice could pass from one child to another but this is unlikely. The way of the louse is through her eggs and we are going to interrupt the egg-laying process to kill off the colony affecting your family. To get rid of lice, you need to remove all lice in your hair from all hatched eggs and have no eggs left in your hair waiting to hatch. The important fact is there are 17 days in the egg-laying cycle. This means from first egg being laid to the next generation egg being laid is approx. 17 days. It can be as short as 15 days and as long as 20 days. With this information (above), it is possible to make a graph of the lice activity going on in your hair. We created a graph showing the lice activity from this devised the actions you will be taking on precise days of the program along with the impact of your actions upon the lice colony. Our aim is to first remove all the egg-laying adults and the maturing adults from your hair, leaving the eggs waiting to hatch. As the eggs will have been laid at different times and on different days, they are not going to hatch all at the same time. Our second aim therefore is to remove all the lice that will hatch out from the remaining eggs over a time frame such that no louse ever gets enough time to reach its egg-laying adult stage. There are several critical days in the 21 day process where you must be extra-thorough. On these days, if you miss the action you need to take, you will fail to eradicate the lice for certain. You will need 2 things. The first is a steel lice comb. These are normally purchasable from drug-stores or chemists. It is important you purchase one with steel teeth not plastic ones. 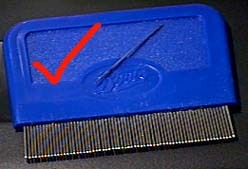 The plastic combs are inferior and are unlikely to remain effective over the 21 day program. If you cannot purchase such a comb locally, several resources are available on the internet. The second weapon is a large bottle of the mildest shampoo you can find. Shampoos made to wash the hair of babies is ideal. We don't need strong shampoo because this is not about keeping hair clean. The shampoo is used only to make the combing process easier as the mild soapy substance helps the comb glide smoothly through thick hair. Find your dairy and select the day you are going to start the progam. Write a reminder against the day and call it day 0! Mark the day after it as day 1 and so on marking off each day until you have written day 21. Now look at the program below. Go back to day 0 of your diary and mark all titles all the days from day 0 to day 21 exactly as titled below. The bold red days are Very Important Program days so put a star against these in your diary. The pink days and red days are combing days and the grey ones are days where you need to take no action so you and your family can have a rest that day! The timetable of the program is visible every time you access The Lice Program web site. By clicking on the day number in the right-hand column, you will get an on-screen reminder of what you should be doing on that day and why you are doing it. You need to plan to have all the members of your family present for an hour on the action days - marked red and pink. Perhaps there is an hour in the evening after dinner and before your children go to bed? Explain they must try and be present at the planned times for the action days of the 21 days. If any are not present, they will need to take the same action as the rest of your family some time that same day. Of course, we are only talking about members of your family sharing the same household. It is best to try and pick the same time each action day to carry out the elements of the program. So if you start at say 7.00 pm on day 0, it is best to do the required actions at 7.00 pm on successive days of the program. If your kids play a lot with the same kids next door or down the block, is it possible to speak with their parents and share the issue about hair lice? Sometimes this may be difficult but it would be a good idea if you can get any of your younger children's parents to carry out the lice program too to minimise re-infestation. The last thing you need to plan is your strategy about talking about the issue with younger children. You need to quell any fears about why you are going to be combing their hair a lot in the coming days. It is up to you whether or not you tell them a 'white' lie to protect their fears and lessen their anxiety about the reality of having creepy-crawlies in their hair. Most kids accept a version of the truth, possiblytoned down a little, rather than a blatent lie. The other thing you need to cover - possibly a little more difficult - is how they behave with their young friends at school or in your home when they play. Maybe teaching them how to hug so heads do not come into contact or possibly just explaining to them that for a while it is best to avoid hugging friends for a few weeks because of (make up a good reason!). It is very important you and your family do not come into head-to-head contact with people outside your household during the 21 days of the program. You do not wish to take the chance of being infested by even just one head louse during the period you are getting rid of yours, and you don't want to infest someone else with your lice. They might give them back to you later after you have cleared yours, if you do. The following text describes in detail the action you need to take each day during the 21 day program on a day-by-day basis. This is the day you first bring your family together, possibly in the evening for their combing session. Ideally, you should ensure all your family members are present at the same time. Each of you will likely have the following scenario going on in your hair, unseen by you. Your hair will contain hundreds of eggs waiting to hatch. They are glued to the hair shafts and there is nothing you are able to do about these in on this first day of action. Some eggs will be hatching - releasing tiny larva, like microscopic maggots, and they will be crawling down to your scalp for their first meal. Elsewhere in your hair will be young lice in various stages of development, some unable to lay eggs yet and some reaching their first day of egg-laying. All of them will be taking trips down to your scalp to have a 10 minute feed of your blood. There will also be adults in your hair, male and female, quite large, with the females busy roaming around laying several new eggs a day each. Your first objective today and tomorrow (day 1), and the next day (day 2), is to remove the current army of adult head lice already laying eggs along with those lice just reaching maturity, and getting ready to lay eggs. These will be the largest lice in your hair so your chances of removing them all are good! To see how you do the combing session Click Here! If you need a reminder of how to lice-comb your hair effectively, there is a link on the Lice Program Web Site front page called Using the Lice Comb that opens up a combing window whenever you click on the link. It is very important whenever you have a combing session that you use the lice comb properly and as described. Take as much time as neccessary on this day to ensure every person has all their head hair combed through from root to tip several times. Wash the comb under fast running water frequently after a few sweeps, and wipe it thoroughly from base to tooth tip with tissue paper (firmly) after every sweep, to ensure lice are not being left on the comb when you re-introduce it into the hair. Do not look for the lice in your hair but use the comb systematically in sweeps so that eventually you will have passed the comb through all of the hair. You will undoubetly miss quite a few lice on your first session. Some of these may still be egg layers but try not to think about these for today. In this program, we have planned for the fact that even while you are trying to remove the egg-laying females, many will still be left in and laying eggs for several more days yet until you get them all. Today's combing session is aimed at removing existing egg-laying adult lice that may have been missed the day before. All your family should be lice-combed today again, ideally at the same time in the day or evening. Do not look for the lice in your hair but use the comb systematically in sweeps so that eventually you will have passed the comb through all of the hair. You will probably find far less lice today then yesterday but it is important to be very persistant. You will have missed quite a few lice yesterday and you need to remove these 'evaders' today. There will be very young nyphs in your hair which the comb may not remove. Do not worry about these as we have planned to get them out later in the program when they are bigger and before they reach an age where they are able to lay new eggs. You might be lucky and get some of these today with your combing session. If so - great! Today's combing session is aimed at a second attempt at removing existing egg-laying adult lice that may have been missed in the last 2 days. All your family should be lice-combed today again, ideally at the same time in the day or evening. Effectively, you are repeating the session you did yesterday. If you and your family and have not missed one combing session in the previous 3 days, you can all have a break today. If you combed properly, then most of the adult egg-laying lice will have been removed. You will still have younger lice in your hair and hundreds of eggs, some starting to hatch, and you might have a few egg-layers left but we will deal with them all later in the program. If you feel you have not done things well in the first few days of the program, then by all means repeat the combing session you did yesterday. We think a rest works well right now and you will have one more chance to remove any egg-laying evaders in action day 5 so take a break and congratulate yourselves for taking the action required so far. Another rest day today. Please take a break from combing and have a good day because tomorrow is a special day in the program and all your family must be present to take a critical action to ensure the program's success. Today is one of the most important days in the program. It is your last chance to comb out any remaining adult-lice egg layers. Bring your family together (if all living in the same household) and perform the lice combing with extra special care and attention. Make sure you comb right from the scalp to the tip of hair tufts and wipe the comb deligently after each stroke. Work through all the hair several tmes and check the comb before re-introducing it to the hair to make sure there are no visible lice stuck on it. The reason today is so important is that the rest of this program assumes that after the combing session today, you are free of first generation lice able to lay eggs and lice just about to reach the stage when they can lay eggs. After today we are only concerned with very young lice, the dormant eggs, and eggs just starting to hatch. You must not miss the combing session today or the program will fail! If you have missed any combing sessions todate, this is the only chance you have left to make amends an get those adult egg-laying lice ou of your hair. This is war and today marks a significant chapter in you winning that war. Yippie! After all that effort yesterday and probably a lot of sore scalps, you will pleased to know this is a rest day. There is nothing new you can do today because we are waiting for some developments from your enemy, the head lice. So relax back and enjoy yourselves. You are entering stage 2 of the program today. With all the adult lice egg-layers gone the second wave of adult egg-layers are in the making as the eggs left behind from the first lice removed will be starting to hatch now. Also, your hair will contain larva developing into their first nymph lice stages. Not all eggs hatch at the same time but you need to start the combing sessions again today to ensure you start to reduce the population of emerging lice. At the moment, none of the lice in your hair can lay eggs. In a few days time, your head will be teaming with the new generation of lice as all the eggs finally hatch. By starting to whittle down the increasing population before it expands, you improve your chances of preventing new-born lice from reaching adulthood when they will start laying new eggs. Another rest day today. Please take a break from combing and have a good day because tomorrow we continue to whittle down the second generation lice currently hatching out of those early eggs. We continue with stage 2 of the program today. At the moment, none of the lice in your hair can lay eggs. The combing session today is a repeat excercise of the session 2 days ago. Our objective is to continue removing new born lice and existing young lice approaching adulthood. Another rest day today and one more tomorrow. Please take a break from combing and have a good day because we are waiting now any remaining lice to get a big bigger and any unhatched eggs to hatch. None of the lice left in your hair can lay new eggs right now as they are not yet old enough. Another rest day today. Please take a good break from combing today because the next few days or so are going to be your busiest ones in this program. At the moment, none of the lice in your hair can lay eggs. The combing session today is a repeat excercise of the session 3 days ago. Our objective is to continue removing new born lice and existing young lice approaching adulthood. Be aware that right now - eggs from 2 generations of lice will either be hatched or will be hatching. It will be a another few days before we can be certain all eggs are hatched and this will be the most critical moment in the program. Another rest day today. Please take a good break from combing today becausefrom tomorrow, you will be at the most critical and important stage of the progam and you will be having combing sessions for the next 3 consecutive days. We are nearly through so hang on in there! Today is the first of three critical days. Your carefulness and attention to patient and thorough combing of you and your family needs to be of the highest standard during these three days. Between today and two days from now, we reach a point in the life-cycle of the lice in your hair where they are most vulnerable. During the next 3 days (including today) all eggs will be hatched out, yet no lice can yet lay new eggs. This is the moment when, if we get them all, there will be no more eggs laid, none left to hatch out, and no living lice left in your hair. This means victory! The uncertainity factor is that there is no way of telling if the last egg will have hatched today or tomorrow, so we need to treat today and each of the next 2 days as if it was the last egg-hatching day. Three combing days all together is likely to test the patience of your family so it is just as important to realise that if you stick through the next 3 days, you will be lice-free for certain! Today is the second of three critical days. Your carefulness and attention to patient and thorough combing of you and your family needs to be of the highest standard during these three days. Stick with it. Repeat the combing you did yesterday. Make sure none of your household family miss their combing session. Wipe the comb in a fresh paper tissue after each pass through the hair and check the comb carefully to make sure no lice are on the comb when you insert the comb into the hair before each stroke. Do not be alarmed if you find you are extracting large numbers of very small lice when previously it seemed there were none left! Today is the third of three critical days. Your carefulness and attention to patient and thorough combing of you and your family needs to be of the highest standard during these three days. Today is the last day you have to remove all existing lice before some of them are able to lay new eggs. You must get any remaining lice out of your hair today! Repeat the combing you did yesterday. Make sure none of your household family miss their combing session. Wipe the comb in a fresh paper tissue after each pass through the hair and check the comb carefully to make sure no lice are on the comb when you insert the comb into the hair before each stroke. Phew! It's time for a rest. The last 3 days of combing probably wore you all out. But, here's some good news. If you stuck to this program right the way through up to now, you are almost certainly free of lice now!! We are going to have one last combing session in a few days or so. It probably isn't neccessary but in case any really tiny lice evaded you, we will give them a few days to get bigger and then we will do a last sweep as a final precaution... just in case! All the lice should be gone now and there should be no eggs left in your hair. We will have a final comb through on day 21 just to be sure, otherwise relax today. Action - Day 21 - The final sweep! All the lice should be gone now but since this is the last day of the program, its worth having one more full combing session with all your family just to be certain that no young lice (very small) have managed to avoid all the previous combing sessions. Congratulations on winning your war on lice! Please click here now to remain LICE-FREE!